Egg Hunt Review Recording Sheet-Any Subject! Any time I can take my class outside, I'm down for it! However, sometimes weather doesn't cooperate, so we "play" inside instead. 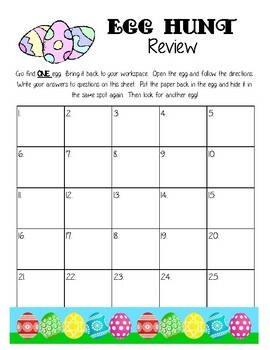 I hide review questions in plastic eggs (and some surprises sometimes too-candy or a question slip with directions to "draw a bunny" or "hop on one foot 5 times") and the kids go find an egg, solve it, and replace it to its hiding place when they're done!